Fascinating resonance experiment by YouTuber Brusspup, known for his science and illusion videos, using sound waves to create patterns in sand. As the frequency increases, the sand patterns become more complex. He states that most of the transitions between patterns are natural with no editing. Certain tones resonate with the metal plate which causes waves to form. These waves crash into each other at certain points which cause the waves to cancel themselves out. It's at these points that the sand forms. 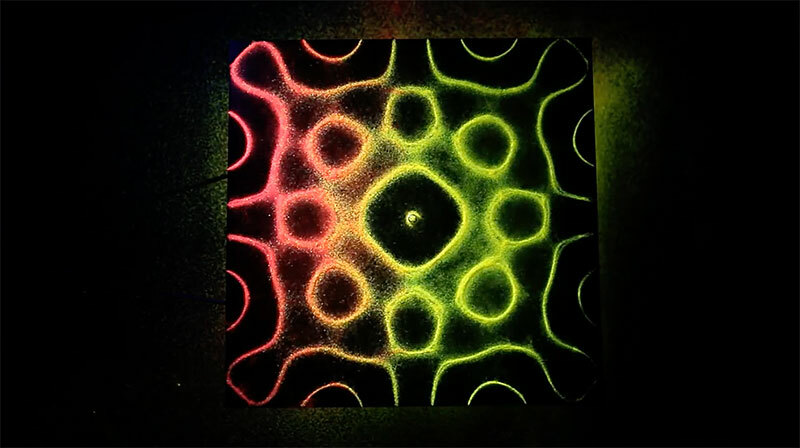 Fascinating resonance experiment by YouTuber Brusspup, known for his science and illusion videos, using sound waves to create patterns in sand.